KING'S THINGS...IT'S MY TWO CENTS! REMEMBER MY OLD USA TODAY COLUMN? IT'S BACK EXCLUSIVELY ON THIS BLOG!!!!! HERE, AGAIN, THE NEW AND IMPROVED KING'S THINGS...IT'S MY TWO CENTS! Whatever it takes, the Dodgers should sign Manny Ramirez or face the wrath of King! I don’t know about you, but I think our election campaigns are TOO SHORT! When I put my Citicorp card in the ATM, will money come out? If anybody has seen Joe Biden, ask him to give me a call! Will double breasted suits ever come back? Will the Lakers ever lose again? Has Michael Connelly ever written a bad sentence? I wonder if Native Americans celebrate Thanksgiving – or even if they should? Why does it take so long for the recount in Minnesota? In this economic crisis, is anyone making money? Raising young boys at my age is wonderful, but rather tiring! 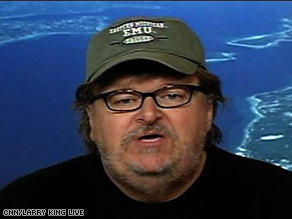 We talked with Michael Moore on Larry King Live. The filmmaker's deep ties to the auto industry start with his father, who worked for General Motors for 35 years. In 1989, Moore became an international figure for his film, "Roger and Me," which centered on the declining auto industry in his hometown of Flint, Michigan and the ripple effect on the town's residents. Michael Moore: When I made that film, there were still 50,000 people working at General Motors in Flint. I mean they had eliminated 30,000 jobs, but there were still some jobs there. Today, I think there's less than 12,000 working in the area, so it has devastated Flint. Flint was one of the first towns to go. When I made that movie almost 20 years ago, I hoped that the film would be a warning to other cities that this corporation was intent upon removing jobs from this country and taking them to Mexico and Brazil and other places. What did you think of the interview ?? Weigh in here!! Happy 90th Birthday Billy Graham! One of our long-time guests here at Larry King Live is celebrating a milestone – his 90th birthday! For the past few months, people from around the world have been leaving personal messages for the Billy Graham at billygraham90.com. So far, the Billy Graham Evangelistic Association says it has received tens of thousands of birthday greetings. Join us in wishing "America's Pastor" all the best on this special day! So here's our plan. We want to know what your opinion is to our question of the day. Our LKL Blog Correspondent, David Theall, is looking for thoughts and opinions he'll read on air tonight during the show! With President-Elect Barack Obama's historic election to the US presidency, should Affirmative Action practices end? What do you think? David and I will be reading your posts, later I'll chat w/ David during the show and we'll work your comments into the show.